Today we mourn the loss of some dear companions who have accompanied us on all our adventures to date. The dearly departed are not of flesh and blood, but rather of aluminum and steel. 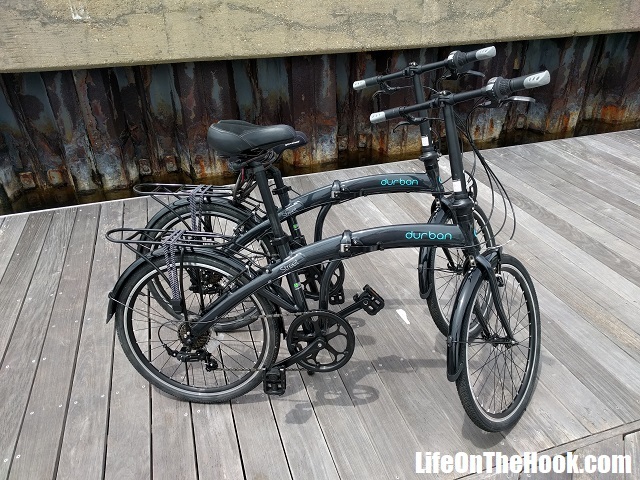 We’re talking about our less than two year old Back Bay folding bicycles, and this will be their final review. We introduced you to our old friends in a previous post, in which we praised their utility. In a subsequent post, we described the issues we were having with their durability in a marine environment and the steps we had taken to maintain them in serviceable condition. I’m sorry to report that upon our return from our recent six month cruise to the Bahamas, we discovered that both bikes had lost their battle with the elements. I’d held on to hope that one more trip to the bike shop for maintenance and repair would render them functional once again, but the cascade of bike organ failure caused by continual exposure to salt spray was just too much for their poor little systems to handle. The brakes were once again frozen, the shifters didn’t shift, and the freewheel on Rhonda’s bike (the set of sprockets on the rear wheel) spun freely in both directions, when it was supposed to turn in one direction only. But the final, fatal failure was the disintegration of the wheels. 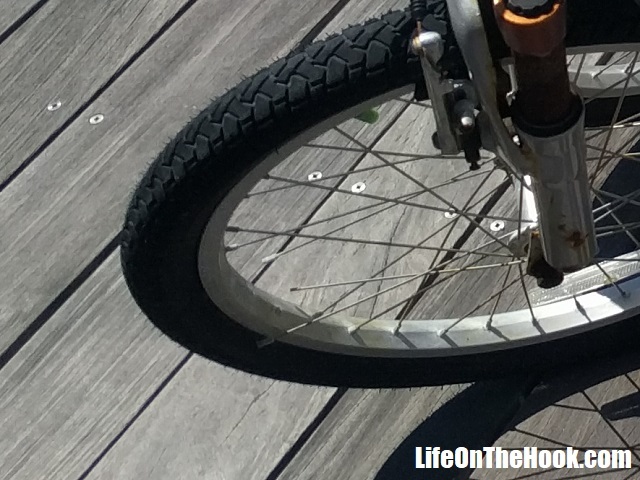 Numerous spokes on both bikes had corroded through and broken free. So at a minimum we were looking at total replacement of the front and rear wheels on both bikes, the replacement of at least one freewheel, and yet another overhaul of the brake and gear systems. Enough was enough. We’d invested almost $600 in the purchase of these bicycles, and had spent another $300 in parts, repairs and maintenance after our initial shakedown cruise to Cuba and Mexico last year. But we were easily looking at another $250 to $300 to get them back on the road again, and it was just good money after bad at this point. So we chucked a thousand dollar investment in the dumpster and decided to start over again. 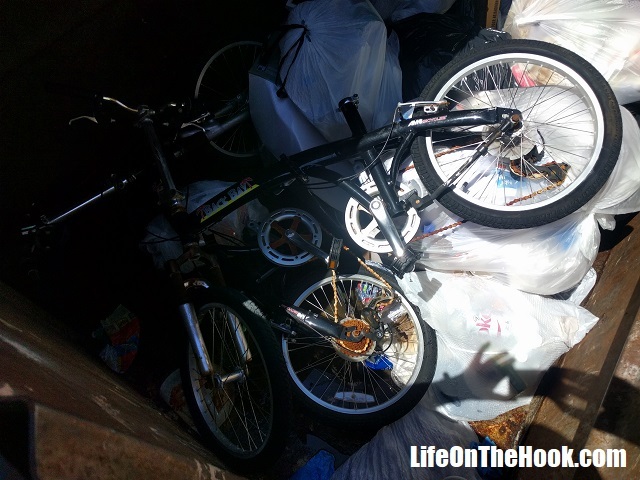 The lesson we learned is that you can’t store bicycles on the deck of a cruising boat. The salt corrosion is just too aggressive. We’d tried keeping them in zippered bags. When that didn’t work to stave off attack by the elements, we tried leaving them open to the air, thinking that occasional rain showers would provide regular fresh water rinses, washing away the salt spray. Who knew that it hardly ever rains in the Bahamas in the spring? While not quite essential gear, we feel that having a set of folding bikes onboard makes life a lot more pleasant. So we wanted to purchase replacements. But this time, we’ll store them below. It won’t be easy to find the space belowdecks on a 37’ sailboat for two folding bikes, but a year and a half of cruising has taught us a bit about wants versus needs, and we’ve therefore been able to offload a bit of what we’ve been carrying around in our “garage,” (i.e. the V berth), so there should be room. Our Back Bay bikes had 20” wheels, which I feel is the minimum size for a good, natural feeling ride. In addition to looking just plain silly, I don’t think the little 12” or 14” wheel “clown bikes,” (my name for them) could handle the curb jumping, pothole dodging, railroad track hopping sort of urban exploring we’ve used our bikes for in the past. This time I thought we’d take it up a notch and spring for a set of folding bikes with 24” wheels. When folded, they’d only be a few inches larger than our old pair, but the larger wheels and thus bigger frame means you’re not sitting directly above the rear wheel when riding, a position that often makes me feel like I’m going to do a wheelie and flip off the back when trying to peddle uphill. A few hours of poking around on Amazon turned up exactly what I was looking for, at a price that I was happy with. Durban is a Brazilian company that designs and builds folding bikes in Rio de Janeiro for urban and commuter use. 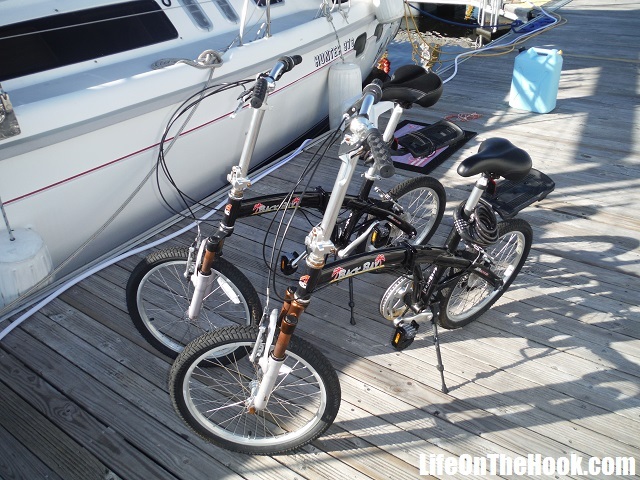 Their Street model folding bike was less than $175 delivered, and I could tell as soon as I unpacked them that they were much sturdier bikes than our old Back Bay bikes, and used much better components with a more precise fit. For instance, the seats slide effortlessly from the collapsed to the extended position, something that was always a struggle on our Back Bay bikes, and the included luggage rack is actually sturdy enough to carry cargo on, unlike the mostly decorative rack on our Back Bays. And they have no chromed steel. Believe it or not, the chromed steel parts on our old Back Bays were the parts that rusted the worst. We’ve had the new bikes for a few weeks now, and so far we like them a lot. As I suspected, the 24” wheels deliver a ride that’s almost exactly like a standard mountain bike. Only time will tell how long our new Durban folding bikes will last. I’m hoping that by storing them below when on passage and with regular oiling, we’ll get much more than the something less than two years of use our previous bikes gave us. Because even though we all know that BOAT means Break Out Another Thousand, it’s just too painful to have to throw a thousand dollars in the dumpster. This entry was posted in What? and tagged Back Back Bicycles Long Term Review, Back Bay Bicycles Fail, Back Bay Bicycles Review on July 21, 2017 by Robert. Now that we’re settled in for the summer, waiting out hurricane season in Pensacola, we’ve been doing some tidying up here onboard Eagle Too. 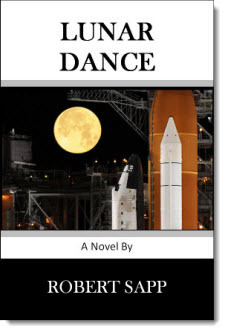 With the exception of promoting my novel Lunar Dance (you have seen the link on the page to purchase it from Amazon, yes? ), we don’t usually engage in commerce here at Life On The Hook™. But I know some of our followers have boats similar to ours, and so I thought I’d quickly mention some windlass parts I just posted for sale on eBay. 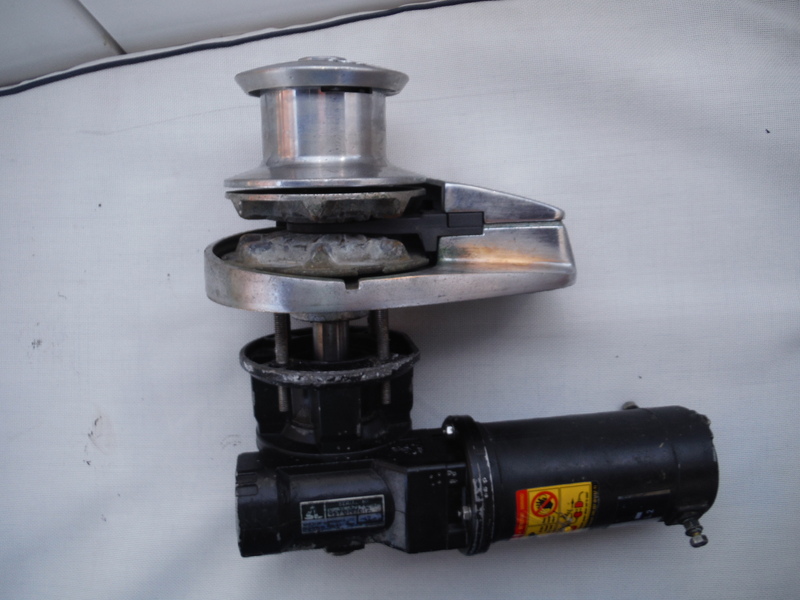 You may remember that we recently replaced our ailing Simpson Lawrence Sprint Atlantic windlass with a new Lewmar V2. Well, the old one still worked, it’s just that it started tripping the breaker under load. I really didn’t have the time or the desire to dissemble it and try to figure out exactly where the problem was. Maybe the motor needs brushes, or maybe the gearbox needs to be disassembled, cleaned and re-lubed, or possibly it just needs a new bearing for the capstan shaft. Don’t know, and I really don’t care. But it occurs to me that someone else might like to take a crack at fixing it, and besides, there’s a perfectly good gypsy and capstan to scavenge for parts. In addition, since the new V2 we installed uses a completely different solenoid pack and breaker, we have no use for the old ones. 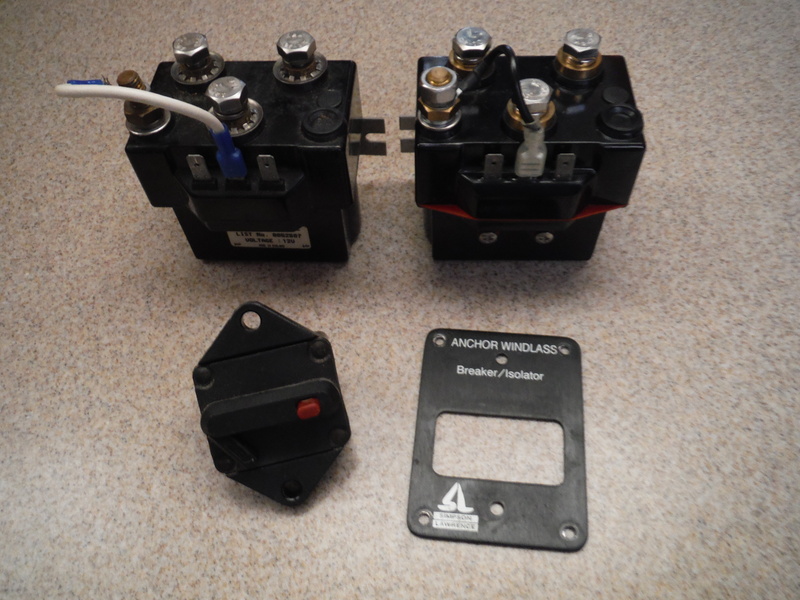 A spare solenoid or two and a breaker can be a handy thing to have onboard, so up on eBay they went. So here’s a chance to grab some spares for your gear, and help us make a little more space here onboard Eagle Too in the process. This entry was posted in Uncategorized and tagged Cleaning House, Simpson Lawrence Windlass Parts on July 4, 2017 by Robert.